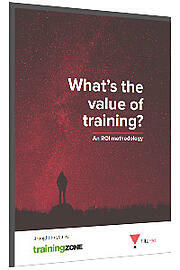 WHAT'S THE VALUE OF TRAINING? What is ROI and whom does it affect the most? Filtered, in partnership with L&D publication TrainingZone, presents an easy formula-based method to measure training ROI - a metric no longer considered mythical or unattainable. Fill out the form opposite to download a copy of this practical and informative whitepaper. To discuss its content and share your views, book a time with our advisors.